Where did voters have the longest wait times in 2014? Which state improved the most from 2010 to 2014? Dive into our updated interactive for answers to these questions���and more. Overall, states' election administration was better in 2014 than in 2010, based on a comparison of midterm voting during those two years. The improvement resulted in part from increased use of online voting information tools. Here's how our index works, why some states are improving while others lag, and what the data mean for future elections. 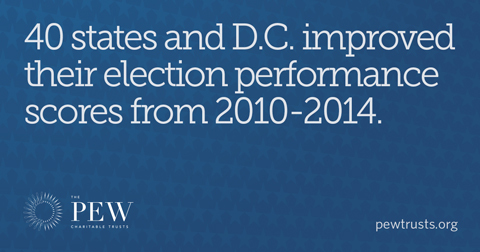 For more information on election initiatives, visit us at pewtrusts.org/elections. Sign up for our monthly newsletter to receive the latest election updates.